Try our Natural Iolite Gemstones Satisfaction Guarantee - compare our prices and our superior quality. Click on any genuine iolite gemstone image below to enlarge it. This iolite gem (also known as water sapphire, and sometimes by the mineral name cordierite) was well faceted with good brilliance into this beautiful oval cut gem with medium dark blue-violet color (100% natural color - it has not been heated or treated in any way). This iolite gem faces up eye-clean with faint natural inclusions that are only visible under very close examination with bright illumination (GIA: Type II Gem, Clarity Grade VVS). Iolite gems such as this one closely resemble tanzanite, at a much lower price! This natural iolite gem has dark blue-violet color (100% natural color - not heated or treated in any way). It is very well faceted with superior brilliance in this oval cut, and it is faces up completely eye clean with just a few very faint natural inclusions that are only visible under very close inspection with bright illumination (GIA: Type II Gem, Clarity Grade VS). The photo at left was taken under incandescent light. This extra dark gem of natural iolite has very dark and intense blue-violet color (100% natural color - not heated or treated in any way). This wonderful iolite gem is so dark that it appears almost black with beautiful flashes of velvety dark violet here and there in its depths. The photo at left was taken under fluorescent light. This dark gem of natural iolite is shallow cut so there is no extra weight, and it is completely eye clean with very faint natural inclusions that are only visible under very close inspection with bright illumination (GIA: Type II Gem, Clarity Grade VS). This is the end of our page displaying Iolite Gemstones. 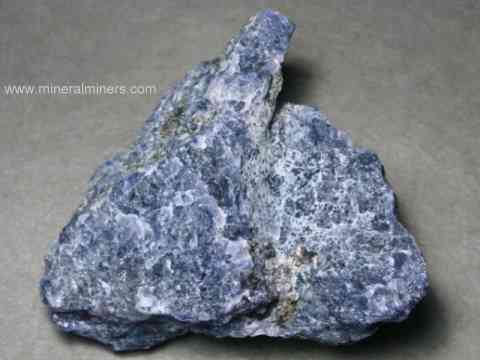 Iolite is another name for the mineral cordierite. Transparent specimens of iolite can show strong pleochrism with blue-violet colors changing to nearly colorless as you turn the iolite in different directions. Iolite has also been known as water-sapphire and also as dichroite in reference to iolite's strong pleochrism. Be sure to see our Iolite Gemstones page. 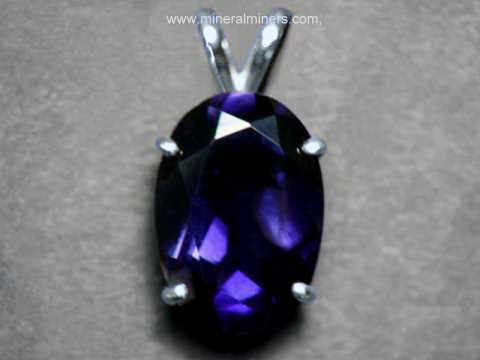 We have iolite gemstones that were mined in tanzania and also some from India. Our selection of iolite rough specimens also were mined at these same locations. 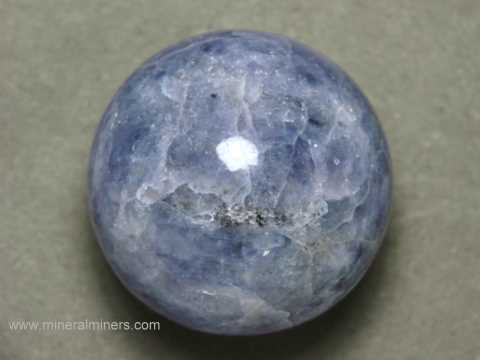 See our natural color iolite spheres and iolite linghams. They were handcrafted from large pieces of natural iolite rough that was found in India. See also our pages displaying natural Iolite Jewelry with handcrafted iolite earrings set in 14k gold studs and also in 925 sterling silver dangles. Our iolite bead necklaces have transparent faceted beads of genuine iolite. Be sure to see our iolite pendants set with superior grade natural iolite gemstones in 14k gold settings. To see more iolite photos, just select another item category from the table below. Would you like us to inform you when we add more natural iolite gemstones on this page? Iolite is also known as water sapphire and by its mineralogical name cordierite. We do have additional iolite gemstones in stock, so be sure to let us know if you have any iolite gemstone special requests. Please contact our webmaster or our 'site' geologist with any questions or comments.